Once I'd rescued my memory fragments from Outlook 2007 my next goal was to unify them from the former Palm Memos I'd (painfully) migrated to ToodleDo and thus Appigo's Notebook.app. I've been reasonably happy with the combination of ToodleDo and Appigo, but notes are very much a 2nd class citizen on ToodleDo (they're all about tasks) and their search tools are pretty weak. I also wanted to be able to access and work with my notes from my desktop on Windows and the Mac, to be able to back them up, to have them be exposed to Spotlight search on OS X, to integrate my old corporate Outlook Notes with my old personal former Palm Memos and to have at least one open source repository in the mix. I needed the notes to live in a standard file format (UTF-8 text or RTF) free of all data lock. Sounds like a lot, but the combination of ResophNotes (XP and higher - free but do donate), Simplenote (Cloud, ad-supported or $9/year - I paid - see documentation), Simplenote.app (iPhone and iPad app, free) and Notational Velocity (open source, OS X - documentation) gave me everything I wanted -- plus Chrome extensions for editing. There was only one thing standing in my way. How could I get my ToodleDo notes into Simplenote? During my early import experiments, because I used a Mac for part of the process, I ran into character encoding problems. Since ResophNotes doesn't yet have note multiselect and delete  I had to find its database and delete it. ResophNotes exports and imports .RSN files (yay! backup! ), but that's not how it works with notes. I found them in "C:\Documents and Settings\jfaughnan" in a .ResophNotes folder (hidden). To delete them and start over you have to quit ResophNotes, then find the instance in Task Manager Processes and kill it, then you can delete the files. That let me start over again. Yes, each note a separate Rich Text file (I may convert to safer plain text) -- all Spotlight indexed. Use ToodleDo's Notes CSV export to my Mac. Import into FileMaker and use Calculation field to merge the ToodleDo Title and Notes into an Outlook style "Note Body". I next renamed the ToodleDo "Folder" column to Category. Created FileMaker columns to match Outlook's names, and exported as CSV. I had to paste this string in as the first row: "Note Body","Categories","Note Color","Priority","Sensitivity". I left all values except Note Body and Category null. In retrospect I should have appended "Categories" as a string to the end of "Note Body" to facilitate search. I used TextWrangler to clean up some character encoding CR/LF issues. This was only necessary because I got a Mac in the mix. Curse that ancient CR/LF screwup. It seems to have survived into the world of UTF-8 encoding. I fired up my Fusion VM (way better than it first was on 10.6) and my old XP image and moved the file over. I opened it in Word and saved as UTF-8 to remove any residual character encoding issues. I imported into ResophNotes. When I was sure all was well, I synchronized ResophNotes with Simplenotes and all my notes merged into one lovely repository. I fired up Notational Velocity in another window and confirmed all was fine there as well. Since the latest version can store as .txt files, I assume one could just delete all the .txt files! I haven’t tried this tough. When Dantz owned Retrospect it was a quirky but reliable SOHO to enterprise cross-platform backup product with a vigorous and demanding customer base. I used the Mac and Windows versions for years. When the Mac was dying (pre- OS X) Retrospect floundered. No surprise. It was sold to EMC where the Mac version was ignored and the Windows version was improved. EMC tried to do a new version, but it was very buggy. Happily they were never able to produce a user guide even a year or so after release. I say happily, because the lack of a user guide was a perfect market of product failure. Only the young would buy a backup product without documentation. Now Roxio owns Retrospect. They've done a new version. The dantz.com user forums are back and there's Product Documentation. It's not yet sold on Amazon however. It's hard to believe Retrospect can be resurrected after such a rough ride, but I'm interested. I'll give it a few months but if it survives I'll test it out. I'd love to have something complementary to Time Machine -- I just don't trust that sucker. What's the best way to manage multiple iPhones in a single family? There are at least two broad approaches, and combinations of them. We've tried 'em all. At the moment we manage 3 iPhones (parents and one child) and 1 iTouch as well as several iPods. I'll share our experiences here. Apple's preference is for every family member to have at least a separate OS X user account, if not a separate computer. Each person should have a companion MobileMe that manages synchronization across multiple machines. Apple would probably prefer that each family member have their own iTunes (.mac) account for media purchases, so DRMd material would only play on one device. This approach does have advantages, but there are obvious disadvantages. It's an expensive and complex approach with a lot of management needs and there are issues with sharing apps and movies. We've used a variant of the "Apple approach" with two user accounts on one machine, and all purchases through a single iTunes account (mine). One account owns iTunes and apps, the second subscribes to App updates through "family sharing" . This does enable each account to have its own Address Book and it aligns well with using MobileMe on phone and multiple OS X machines. This "classic" multi-user approach blows up completely when you add Parental Controls. Among other problems, MobileMe is violently incompatible with Parental Controls. I wasted hours trying to make it work before I retreated to a much simpler Google approach. The Google Approach  is relatively painless. I use it with my son's iPhone. I sync it in my user account for media access and app installation, but I use Google Sync (Exchange server/ActiveSync) against his account on our family Google Apps domain for the phone's email, contacts and calendar. He could access the Google Calendar and Mail through a Parental Controlled account using OS Mail and iCal but in practice he just uses his phone . There are some downsides since iTunes is designed for a single user with a single set of "last played" values and ratings, but in practice the confusion is modest and the pain reduction is immense. It's also much cheaper than the "Apple approach". So, going forward, we're making less use of the OS X desktop, more use of Google (alternative is MobileMe) cloud services. This gets around the sharing/identity problems of iPhone synchronization. We go through some geeky maneuvers so that my wife can have full access to all media from her user account without replicating files. See links below for tips. In short; set iTunes to not import, then media library into client iTunes. Incredibly iTunes creates links to media. You can do this with MobileMe on the iPhone and the MobileMe web interface, but without the Parental Controls-incompatible desktop you lose a lot of the value of MM. For various reasons we've gone the Google approach. Google web browser access is (yet again) OS X Parental Control hell. You can't enable web access to a Google Apps domain without enabling access to Google search. For geeks like you and I, the iPhone 4 is annoying. We’d have been much happier with an enhanced 3GS with more memory, more processing efficiency, a better display, iOS4, better antenna design, less case cracking and built-in bumpers. Alas, Apple gave us a pretty phone. The antenna problem is an annoyance, but even without a case it’s not bad if I minimize skin contact and hold the top of the phone. If I’m ever able to find a case, I doubt I’ll give it another thought. I haven’t yet run into problems with the facial sensor – I guess my face and the way I hold the phone fits Apple’s design. The real problem is the damned phone is too fragile. It feels fragile, it looks fragile, and half the geeks I read are showing broken screens. It doesn’t need a case, it needs a nursing home. If it were possible to find a case I’d have one now. Do not buy an iPhone until you can buy it with a case. In fact, if you don't need an iPhone right now, wait until October. By then iOS 4.1 will be out and many of the worst bugs will be resolved. In fast-to-read-and-write bullet form, here are the rest of my impressions. If I were to do it again I'd probably do the standard update from the existing phone. 3G data service access was initially missing. I had to shutdown, restart and wait a while. Voice mail wanted my voicemail password (PIN really). Facetime: I don’t have time to play with it. It will only be interesting when/if there’s a desktop client. Battery: I’m not big changes over my old 3G. I suspect Push sync is a huge battery killer, and I’m currently synchronizing Calendar and Contacts with a corporate ActiveSync server, Google’s ActiveSync server, and Apple’s MobileMe services. Face sensor: It works for me but I usually use the headphones so I might not notice a big problem. Antenna: If I touch the "dead zone" I drop the call. Elsewhere it's ok. Apple should stop pretending other phones have this problem. It's a genuine design flaw. I'm going to duct tape my phone until I get a case. Retina display: It hasn’t changed my life. Text is easier to read, which is good news for geezer geeks like me but it's not a big deal. Performance: I was using a 3G. I’m seeing performance comparable to my wife’s 3GS. For me, this is a huge improvement but a 3GS users wouldn’t notice much. I think Apple did some keyboard layout consolidation. That’s a relief! I don’t see as much context-specific keyboard reconfiguration. That was a good idea in theory, but in practice it was a pain in the buttocks. I’ve been waiting for multiple ActiveSync servers for ages. I do wonder if the battery drain is worse than CalDAV but this is a meaningful improvement. Calendar is still very weak. The options for scheduling alerts still max out at 2 days ahead -- I need 3-4 weeks. You can only have one alert per item. Recurrence is very weak; you still can't schedule 2nd Tuesday of each month or the 2nd Tuesday of August each year. People over 77 don't exist and color assignments are per server, not per phone. All old bugs and design mistakes, none fixed. Contacts can now be "linked". In the UI this shows as "Linked Cards" and "Link Contact", and in the documentation it's "Unfiied Contacts". This nomenclature confusion is a strong indicator that this feature was released prematurely. Do not use it. The iPhone manual says it's intended to support "contact unification". Contact unification sounds insane -- people with the same first and last names are grouped together in the iPhone UI. You can force this "linking" or break it. This sounds awful. You still can't change group membership in the iPhone. If you select a group when you create a contact it will be assigned to that (single) group. I'm not getting anything out of the multitasking. The apps I use haven't been updated to use it yet. I miss the ability to get to phone Favorites by clicking the Home button twice (now goes to multi-task). The unified email boxes are a nice convenience, but I'd much rather Apple had fixed the damned calendar. You still can't easily delete all images and videos from the iPhone camera roll. You need to use Image Capture on OS X to delete them. Image importing on OS X is as kludgy as ever (it's better on Windows). I think Apple has fixed the bug with deleting a single instance of an Exchange server recurring meeting. It no longer deletes every instance. Wrong. They just changed it to a different bug. The biggest iOS advantage for me is the ability to use ActiveSync with both Google and with my corporate Exchange server. The OS has been stable for me. No crashes. I like that I can turn off Cellular data from the Network setting. Pairing with an external keyboard can be tricky. The ancient text truncation bug in calendar memos has not been fixed. iPhone 4 is an improvement over my iPhone 3, but it's only a mild improvement over the iPhone 3GS (better display, better camera, but more fragile). Certainly nobody with a working 3GS should spend a lot for an iPhone 4. If you have an iPhone 3, and are not in love with AT&T, you might want to buy a used 3GS out of contract and wait and see how the market evolves. The biggest plus is the camera and support for multiple Exchange servers. The biggest minus is that an already fragile phone is now more fragile and the Calendar remains pathetic. Update 7/31/10: I've had no reception on my phone while my wife's 3GS had "four bars" (More bars in more places, fake of course since she's on OS 3.) I restarted my phone and had "three bars". I bet that problem is software related and fixable. You haven't really felt the full pain of OS X's busted parental controls until you try to enable MobileMe access on a restricted account. I've tried and failed repeatedly with both MobileMe synchronization and me.com web access. To enable them I had to disable all application and all web content restrictions. I'd previously run into the Google Parental Controls problem. You can't enable access to a Google Apps domain without also enabling access to Google search. I thought MobileMe would be more parent friendly. I was "oh so wrong", if anything it's a bigger Fail than Google. ﻿If only I could lock Steve Jobs into a room until he got this working. Apple's Parental Controls would be a quite different experience. I give up. Time to try something different. The iPad user guide is available in the iBookstore, but the iPhone user guide is not. The email touch and hold didn't work -- so Apple's documentation is wrong for iOS 4.01. Instead I tapped the link and in Safari I saw an Open in iBooks button. So now I have the PDF manual in my bookshelf. It's not bad, but not clear that there's an advantage over using the web version. I had despaired of rescuing my notes from Outlook 2007. I'd written hundreds over time. In the old days I used Palm products that would sync with Outlook, so I could carry them with me. Now my iPhone, after years of struggle, gives me good Outlook sync with Contacts and Calendars. Notes and Tasks, however, have been orphaned. There's no real hope of an Outlook Notes to iPhone sync solution; although a few people use Outlook Tasks almost nobody uses Outlook Notes. I've learned to live without corporate Outlook Tasks (I schedule my time on a 3 week plan basis), but I wanted those notes. I decided they needed to live within either ToodleDo Notes/Appigo Notebook, iPhone Notes (unlikely), or the Simplenote / NotationalVelocity universe (for various reasons I've given up on Evernote). Today I discovered ResophNotes, a Windows app that syncs with the Simplenote cloud data store. The Simplenote cloud data store, of course, also syncs with Notational velocity (open source, OS X Spotlight indexed), OS X Tinderbox, OS X Yojimbe (3rd party sync), and there's a Chrome extension for editing notes. I exported my Outlook 2007 notes to Outlook's odd CSV format (includes line feeds! ), then I imported into ResophNotes and synchronized with Simplenote's cloud store. Then on my iPhone I viewed them in the Simplenote iPhone client. It worked better than I'd expected. Now I can move my old (originally Palm III Notes, now ToodleDo/Appigo Notebook) personal notes to the same cloud store. I'll sign up for the $10/year premium Simplenote service. (Currently I have free version.) If Simplenote belly up the rich ecosystem and open source Notational Velocity desktop solution provides the insurance I need. Apple - Support - Discussions - iPhone 4 Won't Sync Smart Photo Album. I've confirmed this one. It's broken in iOS 4.01 with iPhone 4. We'll have to wait for a fix. The catch (you knew there was one?) is that the data service block also disables MMS messaging -- even if that is covered by an unlimited texting plan. It does not impact SMS messaging. This time I got yet another response - a very bad one. I'm going to put up yet another post on this topic, including some AT&T policy language that's not publicly available. I'll update this post with a link when the new material is out. I can kill bars by touching any part of the antenna. I used to tune TVs by waving my hands; I think it's a sign of alien possession. I suspect a lot of the antenna problems are actually user-specific. My mother used to have one of our family MobileMe account, but I wasn't using it well. So I removed it. When I gave her an iPad I realized I could create an account on one of my machines and use it to control her calendar and contacts via MobileMe. So I added her back using her old username. When I did that I was asked for her old password. I still had it in my pw database, so I reinstated it. All of her old contact information was still online. Nothing had been deleted. I had a similar experience with an old .mac account of mine. When I went to MobileMe I couldn't use my old discontinued .mac username -- because I'd misplaced the password. If I still had it I wonder if I'd have found my old .mac data still intact. I don't know if, outside of a family account, terminating the account truly removes data. I do know that doesn't happen inside a family account. I also know that you never want to lose your MobileMe password even after you stop renewing. You'll need it if you ever want to resurrect an old user name. Apple doesn't reuse them. I gave my 80 yo half-blind wheelchair bound arthritic mother her iPad. She loves it. She's fascinated by it, her main complaint is that she loses track of time playing with it. She's using the Facebook.app (iPhone, double sized -- which is a feature, see below) to follow me and she composed her first email since her macular degeneration progressed. She manages to drop it into conversations. The amazement and envy of a young supermarket employee is priceless. As with her 2007 Mac Mini, which is increasingly hard for her to operate, I've written up a user guide for Grandma's Accessible iPad. Games are a a good way to learn basic motions. She likes Solitaire, I paid a few dollars for an ad-free product. Ad-supported products are NOT elder-friendly. They're too unpredictable and confusing. Her devices are enrolled in MobileMe, one of our family accounts. I have a "GrandMa" user account on my laptop that syncs with that MobileMe account. That lets me remotely manager her contacts and calendar from my laptop. I'd use "Back to my Mac" from that laptop but I didn't have time to make it work with her ISP (currently blocks needed ports). Old-fashioned desktop-oriented web apps are the most accessible apps because they zoom very nicely. Mobile web apps are the least accessible low vision apps because they don't scale at all (pinch expand doesn't work) and they don't even have configurable fonts. iPhone apps with retina-displays support set to double size are PERFECT for her. Very large UI, very simple UI. It's really annoying that Apple made "zoom" (a very weak feature) incompatible with VoiceOver. They should at least use a rotor gesture for the VoiceOver screen blank feature so the triple finger tap could zoom. Apple's Mail.app is very hard to use with low vision. She has to pull out a magnifying glass (which is a feature of the iPad, they don't work well with desktop screens). Apple's font scaling only shows up in the message, nowhere else. It's really not a very user-friendly app. What's wrong with Google Maps? There's something weird going on with Google Maps. Twice on our family trip, once in Canada and once in the US, Google gave us very scenic but impractical directions. They were quite different from prior directions for identical routes. There were no road closures to explain the choices. No, we weren't choosing the bicycle route. It's as though Google's routing algorithms are mixing up bicycle and auto travel. Weird. I assume it's transient, but it's very annoying. PS. In a separate bug, Google has Sault Ste Marie Michigan and Sault Ste Marie Ontario merged as one location in their database. Any searches on Michigan locations get Ontario results. Sync Hell: MobileMe contact sync bug - does Apple care? Every few weeks, I run across an Apple bug so egregious that I can only conclude nobody there cares. The MobileMe contact sync bug is one of those. As best I can tell only the first, last and perhaps company strings are used to match contacts when synchronizing. So if a contact has only an email address, then the match is on an empty string (null key). This produces many-to-many combinatorials, email addresses that grow with each sync until every empty name contact has every other empty name email. This is an incompetent design. The responsible engineer and product managers should hand their head in shame. Does anyone know of a solution for the 'The information on this page is outdated. Click OK to refresh the page. If you have available updates after refreshing, click Download All Free Updates' message? I open iTunes the go to the app store and click Download All Free Updates. It always gives me the message that the page is outdated, I have to click OK then it refreshes the page with the exact same app updates and I have to click Download All Free Updates again for it to continue. This happens every time I have new app updates whether I launch iTunes or every time the iMac goes to sleep and I open iTunes when it was already running. "Rangeshooter" had the simplest, safest tip. It worked for me. Quit iTunes, restart, try again to install. He suggests its related to iTunes running when a machine goes to sleep. Other tips involved reinstalling iTunes, deleting apps, etc. They were much more invasive. I've seen this error message in the past related to an old app, and deleting and reinstalling that app did the trick. This time it looks like a different problem. Now we see how long it takes Apple to fix this. I've seen some of their bugs last for years. After you get the "this page is outdated" error, click on your email address in the upper right corner, to access your iTunes account. It will prompt you for your password. Once you're on your account page, click Done, and you should be back at the "My App Updates" page. Now, updating all of your apps should work. Thanks! This makes the bug sound like a DRM issue. Update 7/25/10: Fixed in an iTunes update. I have a CD-R containing music that, when inserted in a 10.5.8 machine shows track names. When I insert the same CD in a 10.6 and a different 10.5.8 machine I don't see the track names. The machine that shows the track names is running iTunes 9.1 and is very old. The machines that don't show them are running 9.2. It's 100% repeatable. I think it's either a bug with the new iTunes or something to do with old hardware. 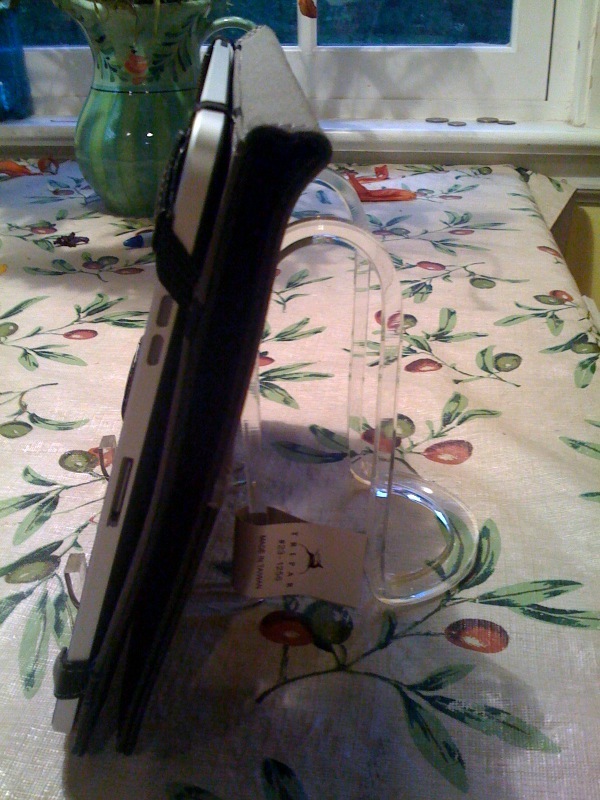 I wanted a stand so Grandma's iPad could show family photos while it charges. I picked up the plastic frame shown here for $6 from a local hardware store. The iPad is in the $25 Griffin case (yes, it blocks the rotation lock, the power switch is beneath a tab so I just push on the tab) folded back on itself. The power cord plugs into the right side. It works well. It's easy to add and remove the iPad without removing the case. I'm getting to the end of configuring Grandma's iPad, but I'll call out one finding early. For someone with low vision, Safari is the killer app. It has full screen reader support, and you can expand many (but not all) web pages with a pinch expand (spread apart). This isn't true of all standalone apps. For example, the pretty but limited NYT Editors' Choice for iPad doesn't seem to work with the screen reader and you can't change the small font. The NYT web site though, is a pleasure to navigate using Safari. Alas, not all web sites are Safari zoom friendly. The iPad optimized Gmail site can't be zoomed, so it ends up being relatively inaccessible. As I configure her device I'm adding several web sites that are pinch-zoom friendly. Ironically, these have to be generic sites. iPad optimized sites are much less low vision friendly. Mind blowing bug that's been around since 2008 ... Apple's Potemkin iOS exchange support - the problem with being a peripheral customer. I bought MarsEdit 3. After a couple of months of use I'd give it a B+. It's much better than anything else on OS X for publishing to Blogger, but it's a weak shadow of Microsoft's (abandoned) Windows Live Writer (Win only). The image handling is particularly weak. On the other hand the bugs aren't too awful and the customer support is superb. I'd love to see Red Sweater study WLW and emulate as many features as possible. Update 8/7/10: I threw MarsEdit off my drive after it produced a complete hash of a post. It looked fine in MarsEdit's wysiwyg editor, but it was a mess in Blogger. I had to fire up an XP VN and use Windows Live Writer to repair the damage. Using a rich text editor as a proxy for a true HTML editor is a bad idea.